If your mantra is “Give Me Money!” you’re finally in the right place at the right time. It doesn’t seem right that the wealth of the world is kept by less than 1 percent of the population, but there are ways of leveling the playing field. 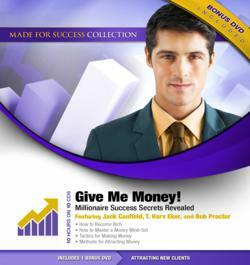 You may be asking yourself, “How can I become a millionaire?” or simply, “How can I be rich?” This is the question of the ages, and anyone looking to know the answer need look no further. In order to reach your moneymaking goals and get all the satisfaction you deserve, you’ve got to start with the proper mind-set. Once you have your attitude in place, the numbers associated with wealth become academic. This concept is the core wisdom of the nine choice speakers and authors in this special program. Each expert has devoted time and attention to the topic of wealth generation and will offer various perspectives with step-by-step instructions on how to be rich. So if you want the answer to the question “How can I become a millionaire?” invest in this audio guide and get started on your wealth-building program today.